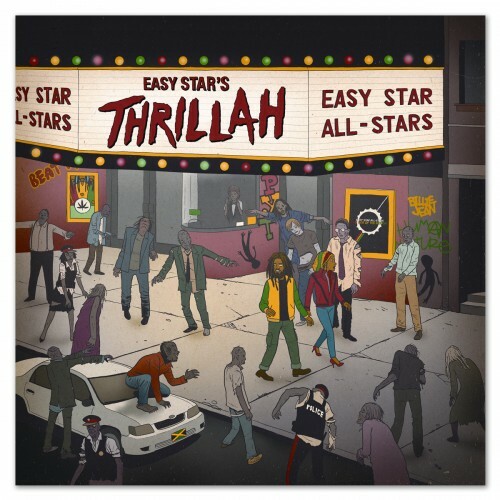 This past Tuesday Easy Star Records released EASY STAR'S THRILLAH by Easy Star All-Stars. You've been hearing about it for months – if you already got it, we hope you are enjoying it; if you haven't, please get a copy, especially this week, so you can help us with the all-important first week numbers. In selecting Thriller, Easy Star Records co-founder Lem Oppenheimer says, "We've always tackled the greats – The Beatles, Pink Floyd, Radiohead – but while we wanted to take on another huge album, we also wanted to blaze new trails. In Thriller we found those new trails in a number of firsts for the series: the first album by an American artist, the first non-concept album, the first R&B/soul record, as well as the first release from the 80s." It always helps if you can post positive reviews of the record at iTunes and Amazon as well. Or just spread word on Facebook, Instagram or anywhere else you hang out online.